General Information: The Naga jolokia, as it is commonly known—also known variously by other names in its native region, sometimes Bhut jolokia—is a chili pepper generally recognized as the hottest in the world. 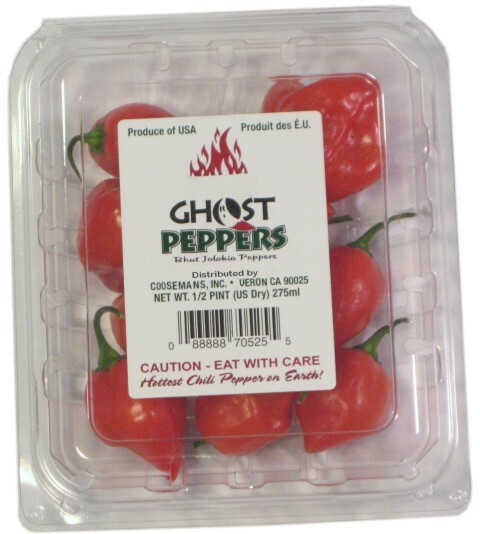 The pepper is occasionally called the ghost chili by Western media, possibly erroneously. The Naga Jolokia is an interspecific hybrid primarily from Bangladesh, but also from the neighbouring Assam region of northeastern India. In 2007, Guinness World Records certified the Naga Jolokia as the world's hottest chili pepper, 400 times hotter than Tabasco sauce. In 2009, scientists at India's Defence Research and Development Organisation announced plans to use the chillies in hand grenades, as a non lethal way to flush out terrorists from their hideouts and to control rioters.